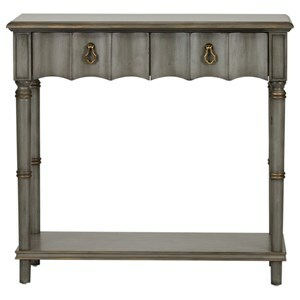 Add an element of classic charm to your living room with this delightful sofa table. A classic antique white finish is beautifully complemented by the gray metal counter top, creating a look that feels light yet durable. 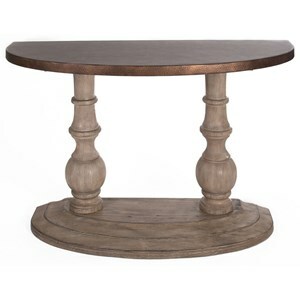 The knobby legs and supports help to complete the more traditional feel that this sofa table emanates. Two shelves and a middle drawer provide you with plenty of space to store your favorite photos or other decorations. A silver finished metal drawer contributes the final touch of character that this sofa table needs. The Fossil Ridge Transitional Sofa Table with Metal Table Top at Van Hill Furniture in the Grand Rapids, Holland, Zeeland area. Product availability may vary. Contact us for the most current availability on this product. Wood & Finish Antique white finish with antique gray finished metal top. Case Detail Knobby legs that help to complete the overall look of the piece.